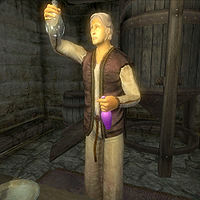 Sinderion is an Altmer alchemist and merchant in the basement of the West Weald Inn in Skingrad. He sells alchemy equipment and ingredients, and provides master training in Alchemy. He wears a set of middle class clothing consisting of a brown shirt, light brown linens, and a pair of pigskin shoes. He carries his key and some gold. He may also be carrying a mortar and pestle. Sinderion knows major spells from the Alteration, Conjuration, Illusion, and Mysticism schools of magic, as well as minor spells from the Destruction and Restoration schools. When Sinderion first sees you enter his home he will welcome you with the comment: "Welcome to my home underground. Hehe." Or if you came here on business: "What brings you to my little home underground?" Speaking to Sinderion before being referred to him by an alchemist will have him greet you by saying: "What can I do for you today? You here to bring me some Nirnroot?" If you speak to him after being referred to him by an alchemist he will be aware of your reason to visit him: "So, you've brought something for me to examine?" Asking him about the Nirnroot at this point will have him describe the plant for you: "Yes, Nirnroot. Haven't seen any yet? It appears as a slightly glowing shoot that grows right out of the ground." Saying that you aren't interested in the botanic world will have him reply: "Oh. Suit yourself." before ending the conversation in disgust. If you came to Sinderion on a recommendation, but without the Nirnroot, he will be aggravated at you for wasting his time: "How can I help you examine the Nirnroot if you don't have one? Come back when you intend to show it to me." If you came with the plant he will be impressed by the quality of the sample, and offer you a job: "Yes, this is a genuine Nirnroot sample. Very nice quality in fact. Hmmm... that gives me an idea. Since you already know what they look like, do you feel up to a bit of a collecting expedition?" If you claim that you don't want this job he will accept your choice, and remind you to see him if you change your mind: "Oh... very well. If you change your mind, I'll be around." Agreeing to take the job will have him pleased with your decision: "Excellent! But before you go, you're going to need to learn a bit more about Nirnoot. Otherwise you may walk in circles and never find any." Ending the conversation with him at this point will have him remind you that he still has more to tell you: "I don't recommend leaving before I've had a chance to offer you more information on your potential reward, although I admire your zeal." If you claim you have seen the plant, or you ask him about the Nirnroot again if you came to him on a recommendation, he will request that you gather Nirnroot for him: "A few years ago, an adventurer not unlike yourself sold me a musty old tome containing alchemical formulas. Most of them were worthless. But one of the moldy pages contained the recipe for a potion known as an Elixir of Exploration, a sort of "ultimate dungeon delver's" brew. The formula looked sound, except it required an extremely rare ingredient. 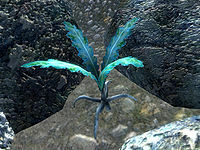 Yes, you guessed it, the Nirnroot. I put the book aside, because frankly, I had so many other delicate experiments going on that I just didn't have the time to go plant hunting. Now that you're here, that changes things." Asking Sinderion about the Elixir of Exploration will have him explain his plans to you: "The Elixir of Exploration is a multi-purpose potion that was obviously created with the dungeon explorer in mind. The formula describes many magnitudes of the brew. If you're interested, I wrote a short missive about it for the Imperial Alchemy Symposium. You bring me 10 samples of Nirnroot, and I'll make the Elixir available to you at a huge discount as well as give you one for free. The best place for you to start would be Shadeleaf Copse, which is a part of the Great Forest northeast of here. Good luck, and hurry back with more of the Nirnroot!" Asking him about Nirnroot again will have him refer you to the missive he gave you: "If you need to know more about the Nirnroot, read the missive." As you leave he will remind you to be careful: "Be careful in Shadeleaf Copse. No telling what else resides there besides the Nirnroot." When you return to Sinderion he will welcome you with the line: "Welcome back." Returning to Sinderion will have him ask you about your progress: "How goes the search?" Asking him about the Elixir of Exploration without enough Nirnroot for Sinderion to begin producing the potion will have him reply: "Hmmm... you don't seem to have enough samples on you. Remember, I need at least 10 to get started." Asking him about the Elixir with the necessary number of samples will have him thank you for your efforts, and tell you about another more powerful version of the potion: "Fantastic! You actually found 10 of the Nirnroot. I'll begin making the Elixir of Exploration right away. According to my research from the tome, I'll need at least 20 more Nirnroot to make the next magnitude of Elixir. In any case, if you come back in about 24 hours, I should have the weaker Elixir ready for you." Speaking to Sinderion again at this point will have him ask that you leave him alone: "Leave me to my work if you want the Elixir made properly." After saying this he will end the conversation. As you leave he will remind you of when to return: "See you in 24 hours." Once you return, after the necessary time for the potion to be completed has passed will have him remind you to pick it up: "Your Elixir is ready!" Speaking to Sinderion after the weak version of the Elixir is finished will have him welcome you by asking about your search: "Any more luck finding Nirnroot?" Asking about the Elixir of Exploration will have him give you an Elixir of Exploration for your efforts, and a reminder to return to him if you wish to buy more: "Here's a Weak Elixir of Exploration. Not bad, eh? If you want more, you can buy them from me. I've discounted them for you, of course." He will also offer you this advice as you leave: "Remember, always look near water. That's the best place to find Nirnroot." Asking him about the Elixir of Exploration again will have him reply: "I really can't do anything without 20 more samples of Nirnroot. Come back when you have them." Once you return with the necessary number of Nirnroot he will be once again impressed at your gathering abilities: "Amazing, you've found 20 more samples of Nirnroot! Well done! I think if I'm to create a strong version of the Elixir, I'm going to need an even greater number of Nirnroot samples than before. 30 should do it this time. Yes, that would be perfect. Oh, and as usual, I'll have the moderate Elixir ready in 24 hours." Interrupting him before twenty-four hours have passed will have him remind you that he must concentrate on the potion: "It would be much easier to make the Elixir if you weren't interrupting me." Once you return at the proper time he will warmly welcome your return: "Hey! Good to see you again!" Asking him about the potion will have him reply: "As promised, I have your Moderate Elixir of Exploration. Use it well! I have more available for a great price if you'd like." Asking him about the Elixir again without enough samples will have him remind you of your task: "Without a full 30 samples, I can't extract enough of it to produce the stronger Elixir. Come back when you've found that many." He will also offer you this advice as you leave: "Nirnroot doesn't need sunlight to thrive. Don't forget to check underground as well." Once you gather the necessary amount he will be astounded at your ability to find this plant: "You're truly a master explorer. To imagine you've actually acquired 30 more samples. I'm astounded. As I'm sure you guessed, to make the grand version of the Elixir of Exploration will take still more samples of Nirnroot; 40 to be exact. Good luck! Oh, and as before, you can pick up your free Elixir in 24 hours." Speaking to him again will have him quite bluntly tell you that he doesn't need the interruption: "Be patient." Once another day has passed he will once again ask if you have enough Nirnroot when you speak to him: "You have the next batch of Nirnroot yet?" Asking him about the promised potion will have him give you the Strong Elixir of Exploration: "One Strong Elixir of Exploration for you... and many more for sale if you wish to buy." Asking him about the Elixir again before you have gathered the necessary forty samples will have him say: "We're so close. Just bring 40 Nirnroot samples, and we can make the best version of the Elixir yet!" He will also tell you that it may be worth searching buildings for the plant: "It's quite possible you may find Nirnroot in people's homes or businesses. Not everyone knows its true potential." Once you have gathered enough samples he will be in awe at what you accomplished: "Words fail me at this point. There must be no stone unturned in all Cyrodiil. I don't know what else to say but to thank you. I'm afraid that this version of the Elixir of Exploration will be the last. I've wrung every bit of information from my research that I can. Since you seem so adept at finding the elusive Nirnroot, if you wish to bring me more, I'd be more than happy to compensate you. Again, I thank you for doing my field work. I look forward to getting more Nirnroot from you. And yes, in 24 hours, I'll have the Elixir ready." Bothering him before the necessary twenty-four hours have passed will have him ask that you be quiet so he can concentrate: "Please... please. The Grand Elixir of Exploration takes incredible concentration to create. So, shhhhhh." Returning after enough time for the next batch to be made will have him ask if you have gathered more Nirnroot so he can purchase the plant from you: "Here to sell me more Nirnroot?" Asking him about the Grand Elixir of Exploration will have him give you the most powerful version of this potion: "Here it is... my pride and joy. A Grand Elixir of Exploration. Use it in good health, my friend. Of course, if you want more of them, I've whipped up a few. Expensive, but worth every coin." Asking him about the Elixir again without at least ten more Nirnroot will have him remind you that you must gather a large enough quantity of them before he will purchase them from you: "There's no point in giving you any more money until you've brought me 10 more Nirnroot samples. Come back when you have them." Asking him about the Elixir of Exploration with at least ten Nirnroot will have him give you a payment of gold in return for the plant: "Reliable as usual. Here's your gold." He will offer you one final piece of advice on where to find the plant when you end a conversation to him: "The only piece of advice I can give you is to leave no stone unturned. Good luck!" His extremely low Mercantile skill and his tendency to have a high disposition towards you (especially if you have completed his quest) makes Sinderion one of the better merchants in the game. He will give you better deals than almost any other merchant. One limitation is that he only has 400 gold available. Another pitfall of selling items to Sinderion, however, is that his list of merchandise never regenerates, which means that he keeps every single item you have ever sold him permanently in his inventory. If you use Sinderion regularly as a merchant the list can become long enough to cause the game to freeze up for a period every time you deal with him. The bug with his non-resetting inventory is fixed by the Unofficial Oblivion Patch. According to Frostcrag Spire Memoirs, Sinderion was a good friend of Taris Rendil and helped to create the apparatus table for the Alchemy Lab in Frostcrag Spire. Sinderion, or rather his skeletal remains, appear in Skyrim, after his obsession with Nirnroot led him to an untimely end. This page was last modified on 23 June 2016, at 21:00.